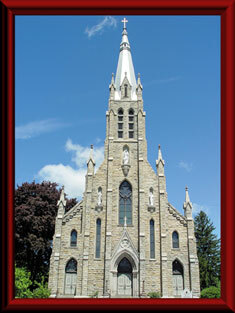 Welcome to the Sacred Heart Parish website. We hope that you will use this site to learn more about our church, our activities, and our people. Sacred Heart Parish, the second Catholic Church in Saint Marys, has approximately 1086 registered families and has been staffed by Benedictine priests since it's beginning. The thoughts of having a second parish in Saint Marys began in 1866 for the Irish immigrants who had difficulty understanding the sermons at the St. Mary's Church, at that time referred to as the "German Church". 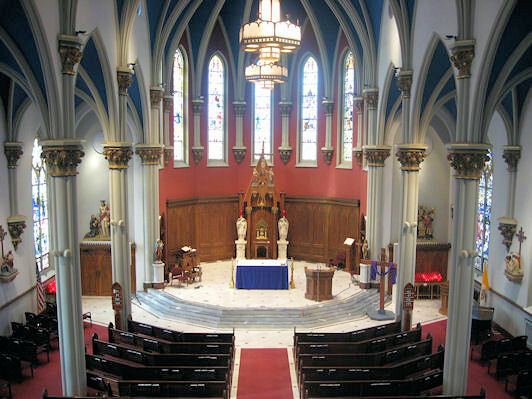 Fundraisers began in 1874 with the original Sacred Heart Church being dedicated on January 18, 1876. With the passing of time and the need for a larger building, the second (present) church was dedicated in 1907. This is a beautiful Gothic structure, with many extraordinarily beautiful stained glass windows from the town of Cologne, Germany. The last remodeling took place in 1999. We are a very active parish with a lot of activities. Come to Sacred Heart and join us in our worship.